Today (March 11th) Animal Defenders International (ADI) welcomes the final stage of implementation of the European Cosmetics Directive. This ends the sale in the 27 countries of the European Union, of cosmetics that continue to be tested on animals elsewhere in the world. 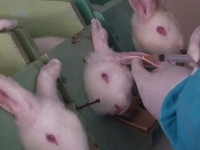 The historic move not only marks the end of the testing of any cosmetics on animals in the EU, but for the first time, puts pressure on cosmetics manufacturers in the USA, and elsewhere to end testing on animals, if they want to sell in the huge EU market of 501 million people.